FiveFortyThree.in launches brand new political website to predict the Indian General Election through Poll Aggregration. 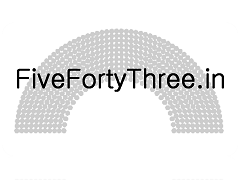 FiveFortyThree.in announces the launch of its new political website, http://www.FiveFortyThree.in. This new site will use poll aggregation to predict the Indian general election outcome. FiveFortyThree.in aims to be a leader in pooling together the various pollster findings and use rigorous statistical analyses to present snapshots and predictions. 'We have already analysed over one hundred state and national opinion polls by various pollsters over the last decade and presented our findings on our website. We firmly believe that a number of pollsters have shown consistent accuracy, and that by using their opinion poll findings, we will be able to accurately predict the election outcomes later this year using a meta-analytical approach', stated Jay Singh, Lead Statistician. To date, no attempt has been made to use methods similar to those developed by Nate Silver and the Princeton Consortium for Indian Election poll predictions. This will be the first time a similar approach is utilized.